Two books from September 10, 2014. Plus, our brand new segment Second Opinions, featuring questions answered by a single listener each week. Starting us off, Jessica Boyd. 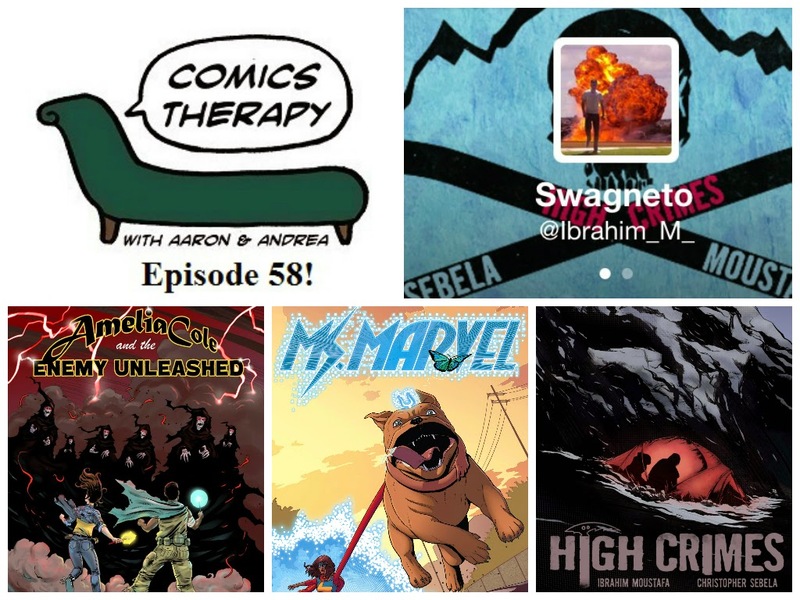 On The Couch: Eisner-nominated artist Ibrahim Moustafa. The theme this week is (deep breath) nonverbal sidekicks and the monologuing women who love them. We’re looking at two comics with strong young female protagonists, both of whom we’ve discussed, but whose point of view, and commentary thereof, is an important part of the identity of the book. In both cases, that insight is tempered by our heroines’ relationships with their nonverbal companions, who serve to actually humanize the interactions with the rest of the characters. Seriously. This is going to be a good conversation. Actually about comics. Amelia and Lemmy. And spoilers. Kamala and Lockjaw. And yet another conversation about predictive gender roles. Ibrahim drew The Pound: Ghoul’s Night out for IDW but you probably know him as the artist on High Crimes, digitally published by Monkeybrain Comics and out in hard cover next spring by Dark Horse Comics. The artist Ibrahim mentions during the interview is Kim Jung Gi.